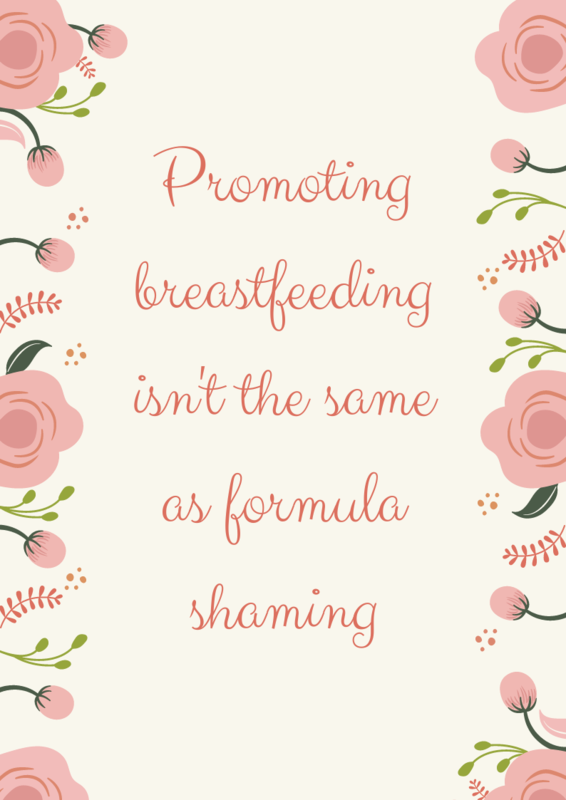 Promoting breastfeeding isn’t the same as formula shaming. It’s 2018 and there is still a debate or even argument among mothers about which type of milk they decide to give to their babies. There is no denying that breastmilk is better for our children than formula. It is made specifically for them and can even tailor make itself to meet their needs like giving them extra antibodies to fight off a cold for example. And whether you like it or not, the UK has some of the worst breastfeeding rates in the world. It absolutely matters which milk you feed your baby because without talking about it, our rates will fall even lower. However, that is not saying that formula is bad and should never be given to babies. Far from it. If you’ve been with me for a long time, you’ll know that my first was on formula from 9 weeks until his first birthday. It just cannot be compared to breastmilk. It contains essential vitamins and minerals, fat and protein which our babies need to thrive but it can’t make antibodies to help them fight an illness. Whenever the word “breastfeeding” comes up in conversation, women seem to get offended. And that offence seems to peak during World Breastfeeding Week. You often hear “why isn’t there a World Formula Feeding Week?” and there’s a very good reason. Formula information, support and adverts are shown to us every single day. To make up a bottle, you need to make sure the bottle is sterilised and put the right amount of powder and water in. It doesn’t require the same amount of support as breastfeeding does. If we’re not allowed to talk about breastfeeding and it’s benefits, women will continue to be uninformed and not supported in their breastfeeding journey. And, sorry to bang on about them again, but the breastfeeding rates will continue to fall. Did you know that it’s only between 1-2% of women who genuinely can’t breastfeed through lack of milk production? Yet when there’s a breastfeeding vs formula debate, there seems to be a lot of women who say “I always feel guilty when I see a post like this. I couldn’t breastfeed my baby and I felt guilty that I couldn’t”. Unless you physically didn’t produce milk, you could have breastfed. The more likely reason you didn’t succeed with it is though lack of support, a tongue tie, bad latch etc. There are so many things which affect breastfeeding yet can be sorted with the correct support. Establishing and succeeding with breastfeeding was one of the most difficult things I’ve ever done. I’ve written about my journey on here before but I was about an hour away from giving up, we both developed thrush and it was excruciating. If the doctor hadn’t squeezed me in at 5pm on a Friday evening, I would have bought formula from Tesco on my way home. It should absolutely be celebrated and talked about because it was difficult, there’s no two ways about it. The point of this isn’t to shame you all into breastfeeding. Fed isn’t best, choice is best. Make the best decision for you and your baby and own that decision. If you tried to breastfeed and couldn’t, don’t think that you failed. Think “I gave it a shot, it doesn’t work for us so I’m going to do what’s right and go for formula”. If you didn’t want to breastfeed, that’s your choice too. But own it and don’t think that every breastfeeding post is an attack on formula. It’s not. Most women just want celebration, support and information when it comes to breastfeeding. Formula is there to help out when we need it. So why can’t we help out other mothers when they need it by supporting them and standing together? Previous: Previous post: We honeymooned in Edinburgh!